Coocase Aluminium box, the X-Series comes stock on most of the Benelli TRK 502 motorcycle in Malaysia. Unfortunately, the boxes has defects on it’s bottom edges which leads to leakage. What is most frustrating that some of us paid and waited for almost 2 months for the Coocase boxes to arrive from China and and only to know that it has defects. Whilst I agree that boxes do leak at certain period of time but I don’t expect it from a brand new box. 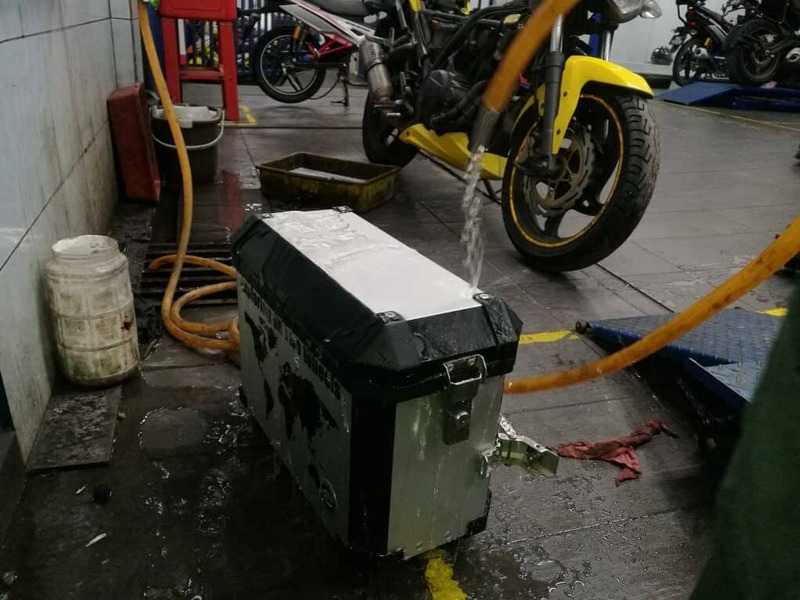 I noticed the boxes had water in the bottom when I was riding in the rain for only couple of minutes. I had my Macbook Air laptop in it and can you imagine what will happen to it if I ride it for half an hour? At first, I thought it would be just mine and a quick check with other Coocase box owners, it seems almost all of them are affected. I called Mforce (Benelli Distributor in Malaysia) and they said they are aware of this issue and said that I could come over and have my boxes fixed. I went there last Friday and the first thing I told the person in charge to just take the water hose and spray over boxes and the water was just pouring in around from bottom corner. The technician cleaned the box and glued every edges/corner with silicone glue using hot gun which fixed the problem but deep inside my thoughts, I know this is just a temporary fix as the silicone isn’t the way forward as it will start to peal off and it does not last. The outer part was also glued as you can see at the image below. I know it looks ugly, perhaps it would be better if the edges covers been removed first before adding the silicon glue? I recorded the video below so that other affected owners can DIY themselves on how to fix this (temporarily). Should the leakage happens again, the only other solution that I can think off is to drill couple of holes in the bottom of the box so that the water drains out? Moving forward, I’ll also need to ensure that packed everything in waterproof inner liners so that it will not get wet. Honestly, Coocase should take ownership of this problem and come with a better solution or at least say expect this from our product – or sorry no, this is unacceptable!